Me with the greatest of the birds: The Chicken. Hi there! 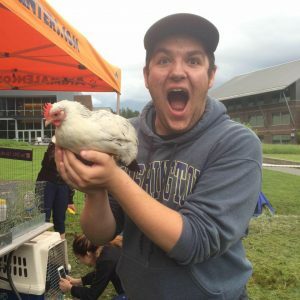 My name is Nathan and I am a current student at the University of Washington Bothell Campus, where I am working towards a degree in both Public Policy and Environmental Studies. Along with going to school, I currently am a supervisor and trainer for Ezell’s Famous Chicken, a favorite local restaurant in Seattle. In my spare time, I like to volunteer at a homeless shelter in Downtown Seattle as a public relations and technological intern. I am super excited to be a part of this adventure and learn more about the Maori culture while I explore the wonderful country of New Zealand! For me, this program is a way to look into how other indigenous peoples have dealt with colonization, and how they currently are represented in their country and throughout the world. New Zealand is of particular interest due to the unique way that the country’s government and native populace have addressed the issues that occurred in the past: through the Waitangi Tribunal, which hears cases where the Treaty of Waitangi was broken. I take a great interest in the Waitangi Tribunal as a potential way to address the United States own issues regarding treatment of the indigenous populations. My plans beyond college will likely lead me into a governmental agency, so I’m looking at bringing new ideas to help create policy that will be beneficial to the indigenous peoples of the United States. Furthermore, this is an excellent travel opportunity for me to explore and experience new cultures as well. New Zealand will be the 14th country that I’ve gotten a chance to experience, and I look forward to the adventures that it will bring. I enjoy comparing and contrasting the various countries to see the cultural differences and to gain a better understanding of the world around me. I am happy to be apart of this trip, and I am looking forward to the adventures that will be occurring on the trip! This entry was posted in Author Bios and tagged #Chicken, Aotearoa on August 27, 2017 by vallen.